Links to a series of galleries of images of Blackwood and Kirkmuirhill Gala in South Lanarkshire, Scotland. Blackwood and Kirkmuirhill are two villages that are now joined together as one unit. The weather was hot and sunny. Both Coalburn IOR Pipe Band and Coalburn Silver Band took part; the pipe band led the procession. Unfortunately this year there were only two floats. These photos were taken in Southfield Road, Thornton Drive and Scott Street. Despite a forecast of rain, the rain stayed away for the procession and it became much brighter fot the Coronation. Coalburn IOR Pipe Band were not there this year (away in a competition), so the procession was led by Coalburn Silver Band. These photos were taken in Southfield Road, Thornton Drive and Scott Street. The weather was overcast and the rain managed to stay away for the procession. This day was also the Queen's 90th Birthday, so two groups had walking floats with this theme with huge birthday cakes pulled around. Even the Royal Family attended! Some great work put into the floats by all concerned. These photos were taken in Southfield Road and Thornton Drive. The weather was overcast but the colours on the floats and costumes made it a bright event. The winning float was "Over the Rainbow". This series of pictures were taken in Southfield Road, Heathfield Drive, Scott Street and Lochanbank Park. Bright, warm and humid weather helped to make the annual Blackwood and Kirkmuirhill Gala successful. This series of pictures were taken in Southfield Road, Heathfield Drive, Scott Street and Lochanbank Park. 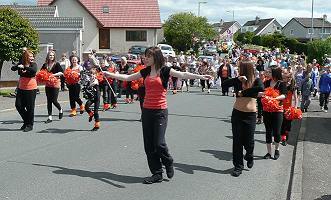 2012 provided good weather for the annual Blackwood and Kirkmuirhill Gala procession. 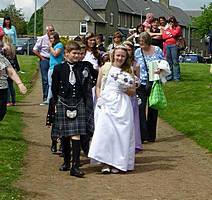 This series of pictures shows the procession through the village and some of the activities at Lochanbank Park. The rain just managed to stay off for the 2011 Blackwood and Kirkmuirhill Gala procession. This series of pictures shows the participants in the procession, the Coalburn IOR Pipe Band and the Coalburn Silver Band. The weather was warm and sunny for the 2010 Blackwood and Kirkmuirhill Gala and the joint villages put on a wonderful procession through the streets. This series of pictures shows the participants in the procession, the floats, the Coalburn IOR Band and the Coalburn Silver Band. There is one picture taken of the Gala Queen and her Court after the crowning.